Spirit is one of the most important modules of the building information network www.softtech.com, providing consistent support from the first sketch to visualisation and from permit planning to quantity take-off. Disciplines comprise architects, interior designers, stress analysts or carpenters as well as town councils or general contractors. Spirit offers an option called Special Colours in the Colour Palette manager to access Resene electronic colours so that you can add those colours to your standard colour palette for use in your drawing. When these colours are added to the standard colour palette they will be marked with an x, which indicates that these special colours are protected (they cannot be edited). Use the Load Special Colour Palette icon to select a Resene colour palette to load, such as the Resene Roof Systems Chart. 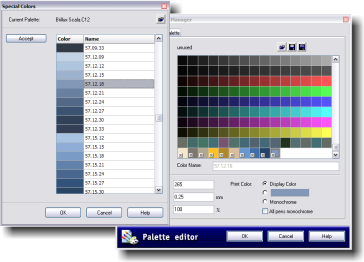 Select a colour from the available list you want added to your standard colour palette and select the Accept button. Continue selecting additional colours to add and selecting accept after each one. When you are finished adding special colours, select the OK button to exit. Download the Resene Special Colours for Spirit. To find out more about Spirit visit www.procadsys.co.nz or email matt@procadsys.co.nz.